Houston, we have a problem. We need jobs. The never ending political banter on immigration is a droning inane brew of special interests. One thing always is constant. At the back of the pack is America's middle class. We even have various groups supposedly representing U.S. labor who seem to be interested in illegal immigrants instead. Even worse, we have numerous lobbyists spinning out economic fiction, trying to claim offshore outsourcing is good for America or displacing U.S. workers with foreigners is somehow good economically. Neither is true. Worker displacement is worker displacement and if anyone is alive these days, the employment statistics say it all. Indeed we saw the foreign born getting majority of the jobs from 2008-2010. We need jobs for U.S. citizens, American workers. We also need a big legal rubber stamp proclaiming U.S. workers are preferred for all jobs within our shores. U.S. 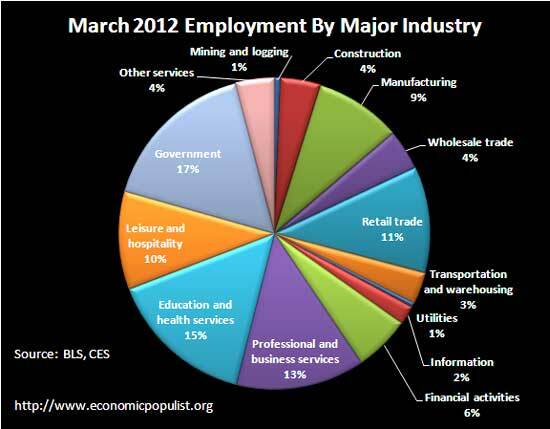 Corporations made record profits in 2011 while regular people went without jobs. A new study from the International Labor Organization shows Corporate Profits are doing fine and back to pre-recession levels. Yet this is at the expense of American workers and investment in America. The ILO covers labor internationally. From their report, the world of work, there are some dire predictions. Austerity is one thing killing economies. The authors also found no recovery in sight for labor markets. They also realize as do many, except for those who could actually do something, if policies were enacted that were geared towards labor, we would not be in this mess and finally, the high unemployment and never ending income inequality is brewing up a nasty mix of social unrest. More than half of 106 countries surveyed by the ILO face a growing risk of social unrest and discontent. Add to that a new report from the Census, in part sponsored by the ,Kauffman Foundation, shows start-up companies are at record lows, 8%, in the United States. U.S. multinational corporations are hiring. The problem is most of that hiring is happening abroad. In an updated BEA summary on sales, investment and employment by Multinational Corporations for 2010, we have a 0.1% increase in hiring for jobs in the United States while MNCs increased their hiring abroad by 1.5%. Worldwide employment by U.S. multinational companies (MNCs) increased 0.5 percent in 2010, to 34.0 million workers, with increases in both the United States and abroad. Employment in the United States by U.S. parent companies increased 0.1 percent, to 23.0 million workers, which contrasted with a 0.6 percent decrease in total private-industry employment in the United States. The employment by U.S. parents accounted for roughly one-fifth of total U.S. employment in private industries. 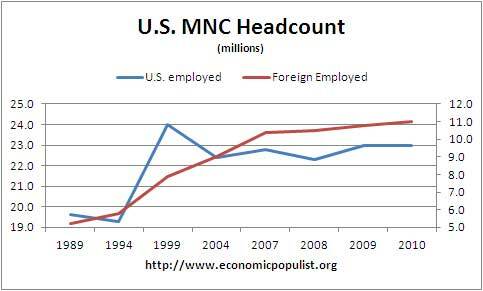 Abroad, employment by the majority-owned foreign affiliates of U.S. MNCs increased 1.5 percent, to 11.0 million workers. U.S. multinationals account for 20% of U.S. hires in the private sector. Yet from 1999 to 2009, U.S. MNCs decreased U.S. employment by 1 million workers while expanding employment abroad by 2.9 million. The U.S. share of employment by MNCs went from 75.2% in 1999 to 67.7% by 2010. Today our statistic is from Mitt Romney. Team Romney claims women have lost 92.3% of the jobs since Obama took office. U.S. Treasury Secretary Geithner, acting as political pundit, calls Romney's new favorite statistic ridiculous. First off Romney is right. Since Obama took office in January 2009, the below graph shows the total job losses by women as a percentage of the total job losses. As of March 2012, it is 92.3%. 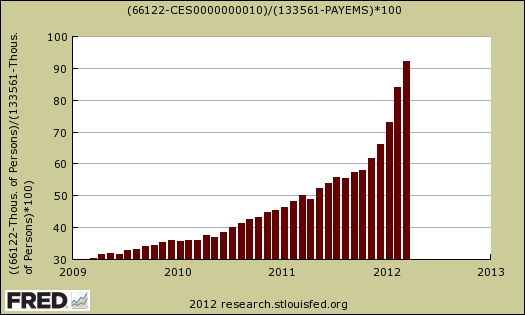 The BLS reports on individual occupations and wages. This is a separate survey from the employment report and unfortunately there is significant lag in the breakdown of 800 different specific job categories from the current overall employment statistics. While waiting for the March unemployment report to be dissected and digested, it might be of interest to look at the most recent occupational survey statistics from the BLS. 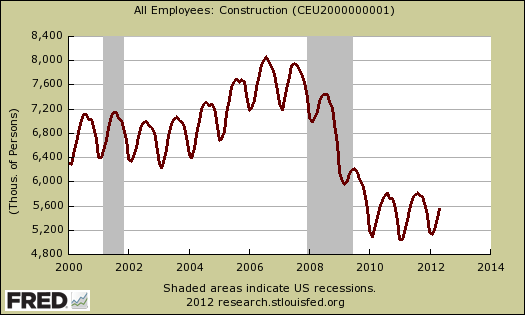 For May 2011, 10 months ago, we have some seriously crappy jobs dominating the labor market. We told ya so, yet people don't listen. The Federal Reserve FOMC meeting minutes were released and showed no quantitative easing for you. A couple of members indicated that the initiation of additional stimulus could become necessary if the economy lost momentum or if inflation seemed likely to remain below its mandate-consistent rate of 2 percent over the medium run. The FOMC has 10 voting members. The news is clear, those in favor or more quantitative easing are now 8 to 2 and if and only if the economy goes further into the tank. We're sure some will hold out hope against hope that more quantitative easing will happen. After all there are two members of the FOMC leaving the door open on more quantitative easing if the unemployment situation gets worse. That said, the next time you see some major investment group claiming QE3 is sure to arrive, check their interests and why that group is making such a claim. Alternatively just read us, we sure knew QE3 was not gonna happen.